At the beginning of the 20th century the automobile was a plaything for the rich. Most models were complicated machines that required a chauffer conversant with its individual mechanical nuances to drive it. Henry Ford was determined to build a simple, reliable and affordable car; a car the average American worker could afford. Out of this determination came the Model T and the assembly line - two innovations that revolutionized American society and molded the world we live in today. steadily reduced the cost of the Model T. Instead of pocketing the profits; Ford lowered the price of his car. As a result, Ford Motors sold more cars and steadily increased its earnings - transforming the automobile from a luxury toy to a mainstay of American society. 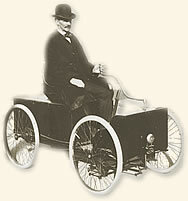 The Model T made its debut in 1908 with a purchase price of $825.00. Over ten thousand were sold in its first year, establishing a new record. Four years later the price dropped to $575.00 and sales soared. By 1914, Ford could claim a 48% share of the automobile market. Central to Ford's ability to produce an affordable car was the development of the assembly line that increased the efficiency of manufacture and decreased its cost. Ford did not conceive the concept, he perfected it. Prior to the introduction of the assembly line, cars were individually crafted by teams of skilled workmen - a slow and expensive procedure. The assembly line reversed the process of automobile manufacture. Instead of workers going to the car, the car came to the worker who performed the same task of assembly over and over again. 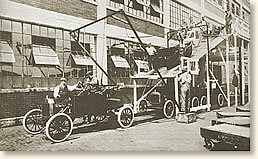 With the introduction and perfection of the process, Ford was able to reduce the assembly time of a Model T from twelve and a half hours to less than six hours. The room he had in mind became the maternity ward for Model T.
The summer before, Mr. Ford told me to block off the experimental room for Joe Galamb, a momentous event occurred which would affect the entire automotive industry. The first heat of vanadium steel in the country was poured at the United Steel Company's plant in Canton, Ohio. Actually it took four years and more to develop Model T. Previous models were the guinea pigs, one might say, for experimentation and development of a car which would realize Henry Ford's dream of a car which anyone could afford to buy, which anyone could drive anywhere, and which almost anyone could keep in repair. Many of the world's greatest mechanical discoveries were accidents in the course of other experimentation. Not so Model T, which ushered in the motor transport age and set off a chain reaction of machine production now known as automation. All our experimentation at Ford in the early days was toward a fixed and, then wildly fantastic goal. By March, 1908, we were ready to announce Model T, but not to produce it, On October 1 of that year the first car was introduced to the public. From Joe Galamb's little room on the third floor had come a revolutionary vehicle. In the next eighteen years, out of Piquette Avenue, Highland Park, River Rouge, and from assembly plants all over the United States came 15,000,000 more." it. Charlie Lewis, the youngest and most aggressive of our assembly foremen, and I tackled this problem. We gradually worked it out by bringing up only what we termed the fast-moving materials. The main bulky parts, like engines and axles, needed a lot of room. To give them that space, we left the smaller, more compact, light-handling material in a storage building on the northwest comer of the grounds. Then we arranged with the stock department to bring up at regular hours such divisions of material as we had marked out and packaged. This simplification of handling cleaned things up materially. But at best, I did not like it. It was then that the idea occurred to me that assembly would be easier, simpler, and faster if we moved the chassis along, beginning at one end of the plant with a frame and adding the axles and the wheels; then moving it past the stockroom, instead of moving the stockroom to the chassis. I had Lewis arrange the materials on the floor so that what was needed at the start of assembly would be at that end of the building and the other parts would be along the line as we moved the chassis along. We spent every Sunday during July planning this. Then one Sunday morning, after the stock was laid out in this fashion, Lewis and I and a couple of helpers put together the first car, I'm sure, that was ever built on a moving line. We did this simply by putting the frame on skids, hitching a towrope to the front end and pulling the frame along until axles and wheels were put on. Then we rolled the chassis along in notches to prove what could be done. While demonstrating this moving line, we worked on some of the subassemblies, such as completing a radiator with all its hose fittings so that we could place it very quickly on the chassis. We also did this with the dash and mounted the steering gear and the spark coil." The basics of the Assembly Line had been established but it would take another five years for the concept to be implemented. Implementation would await construction of the new Highland Park plant which was purpose-built to incorporate the assembly line. The process began at the top floor of the four-story building where the engine was assembled and progressed level by level to the ground floor where the body was attached to the chassis. "By August, 1913, all links in the chain of moving assembly lines were complete except the last and most spectacular one - the one we had first experimented with one Sunday morning just five years before. Again a towrope was hitched to a chassis, this time pulled by a capstan. Each part was attached to the moving chassis in order, from axles at the beginning to bodies at the end of the line. Some parts took longer to attach than others; so, to keep an even pull on the towrope, there must be differently spaced intervals between delivery of the parts along the line. This called for patient timing and rearrangement until the flow of parts and the speed and intervals along the assembly line meshed into a perfectly synchronized operation throughout all stages of production. Before the end of the year a power-driven assembly line was in operation, and New Year's saw three more installed. Ford mass production and a new era in industrial history had begun"
Charles Sorensen's account can be found in: Sorensen, Charles, E., My Forty Years with Ford (1956); Banum, Russ, The Ford Century (2002); Brinkley, Douglas, Wheels for the world: Henry Ford, his company, and a century of progress, 1903-2003 (2003). "Henry Ford Changes the World, 1908," EyeWitness to History www.eyewitnesstohistory.com (2005). Oops! 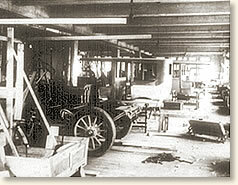 - Ford completed his first car at 2 AM on the morning of June 6, 1896. Unfortunately the car was wider than the door to the shed in which it was assembled. It took an hour to knock bricks from the door frame and make a hole large enough for the car - it was then successfully road tested. In 1914 Ford stunned the nation by raising the minimum wage of his workers from $2.83 for a 9-hour day to $5.00 for an 8-hour day.